Universal Studios announced today that it will increase the amount of biodiesel it is using at the popular Orlando theme park. 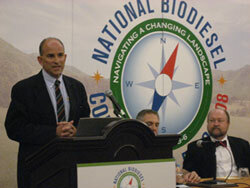 In a press conference today at the 2008 National Biodiesel Conference and Expo, David Winslow, Senior Director Engineering and Environmental Sustainability Technical Services, for NBC Universal, says the park is converting the ourboard engines that take guests from the park’s hotels to the attractions to B20 biodiesel. In addition, the percentage of biodiesel will be moved up to B50 and possibly even as high as B100 down the road. 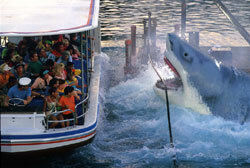 So when guests go to see the Jaws attraction, they’ll be able to jump out of their skin as the mechanical shark makes his deathly lunge fueled by biodiesel. I went to Universal just a few minutes ago to see firsthand how they are using the green fuel. Although Jaws was closed for scheduled maintenance, I still got to see behind the scenes where they fill up all of the vehicles with B20 biodiesel. Check out this short movie I made (not quite Spiderman, but I’m working on it! ).